What they wanted was Luke Skywalker "The Legend." And they still don't realize that we actually DID get that, just not in the way we thought...case in point, the final scene. "A buddy of mine saw Kylo Ren take his shirt off in the shower and he said that Kylo Ren had an 8 pack. 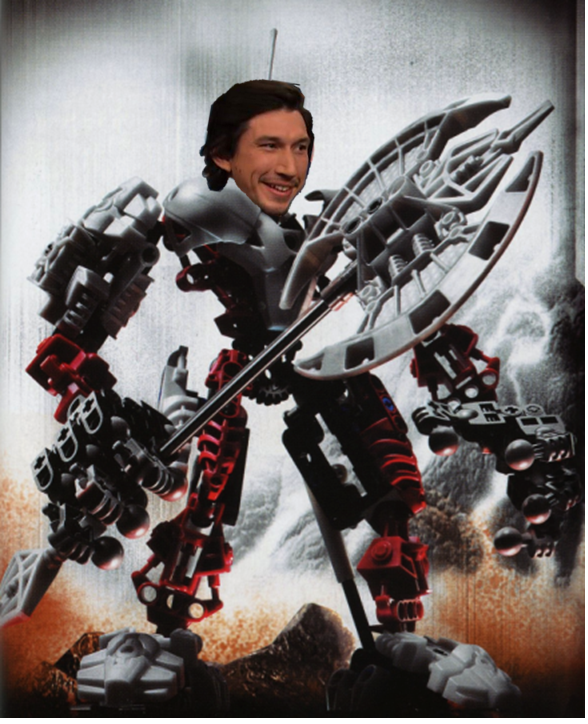 That Kylo Ren was shredded." Do they all have weirdly disproportionate bodies? I can’t believe people still believe Disney pays off critics. That is utterly ridiculous. People need to grow up and realize that people have different opinions than them. As well as the argument of “that review is biased” that’s what a review is, it’s someone’s opinion which is inherently biased. I highly doubt Disney pays off critics, considering that not that long ago critics were boycotting Disney. While the movie had flaws, I like the overall theme the movie went with. It took stereotypes from the first trilogy the series had later abandoned in games like KotoR and other media, and turned them on their heads. In fact, it seems they're setting up for the idea of grey Jedi. It seems pretty obvious since Rey outright rhymes with Gray. The series isn't known for incredibly complex naming schemes, after all. The chances of Edgar Wright doing a Star Wars Movie increased by his cameo in this. Also Joseph Gordon levitt is definitely going to be the main character in Rian Johnson’s trilogy. I thought so at first too, but then I realized that wasn't what Luke, or the film, was implying. The "balance" of the Force, stated by George Lucas, is when the light side reigns and the Force is allowed to do as it pleases. The Dark Side enslaves the Force for selfish gains, leaving to an imbalance. That's the main difference between the light side and the dark side. Thus was established in Empire Strikes Back and the films have followed it ever since. The Force, however, has a will, and as such it willed Rey to gain her powers since Kylo was a HUGE disruption to the Force. Hence why she can suddenly use it effectively. "Darkness rises, and light to meet it", as Snoke said. When we saw the life and death on screen, I don't think it was implying the dark and light side; rather, we saw the nature of the Force and how it affects living things. Luke even says there was balance before Kylo Ren rose to the dark side, implying that the light side IS proper balance to the Force, as per tradition set up by Lucas. i much more prefer the idea of Dark and Light being needed for the balance than the light needing to reign supreme. And as i see it, Jedi and Sith are in a way two sides of the same coin. The jedi wish to live with rules and looking in the past for guidance for the future. the Sith wishes freedom and use different means (like Sith alchemy) to gain new knowledge that not even the Jedi would discover. It would be much more interesting if instead of continuing the battle between light and dark, they instead show what it will be like if both the teachings of the Jedi and the Sith were used. See you're falling for the dogmatic view of the Jedi that the Sith have painted. Sith only seek selfish power. This has been portrayed across all Star Wars mediums. Even if the Jedi are actually narrow-minded, at the very least they've balanced the Force. The only reason the Jedi Order failed in the prequels was due to them being selfish and way too cautious. I understand people wanting the focus on the Ying-Yang and the idea of Grey Jedi, but it doesn't fit very well with the OT, especially on what it said about the Force. I feel the trilogy definitely has the balance. In the Clone Wars, there were thousands of Jedi, and two Sith (if Dooku counts). So, Light, even though it was corrupted, triumphed over darkness. The Emperor kills off all of the Jedi except two, making the Sith and Jedi equal. The Emperor gains so many followers, Darkness triumphs over Light. Luke becomes the only living Jedi after Yoda "sleeps", and battles the Emperor and Vader to restore balance. Vader is still the Chosen One, and brings balance to the force by removing the main point of darkness: the Emperor. Vader dies off, Luke becomes a master, and trains more Jedi, until Snoke rises. While Snoke is not a Sith, he still is on the dark side. He balances the force by having Kylo kill everybody, but then takes greater control, putting Dark over Light. So basically, Star Wars is just the back and forth thing. The only issue with this is that it is a balance in name only. Yes, the two sides of the Force are on equal footing, but if you look at the physical state of the Galaxy when that is the case, there's constant warfare, i.e. chaos. Even if everyone used both the Light and the Dark, having both allows for temptation, and temptation will inevitably be accepted, leading to things like the Sith. Only the Light Side being in control can let the Galaxy experience peace. Total Light is just as much a balance as a combination of Light and Dark, or even total Darkness, but only the dominance of the Light Side guarantees peace.